Increase pastoral household incomes and improve their resilience and adaptive capacity to climate change. PRIME aims to build capacity and promote the market readiness of targeted chronically food insecure populations by supporting the development of sustainable livelihoods and creating economic linkages between these regions and productive areas through a “push-pull” model. PRIME will “push” pastoralist and ex-pastoralist households out of chronic poverty via improved and sustained livestock assets. At the same time, PRIME will “pull” livestock products supply from pastoral areas to targeted value chains (see AGP-Livestock Market Development in productive areas. 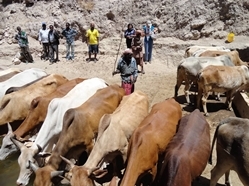 PRIME is a follow-up project for the Pastoralist Livelihoods Initiative – Phase II and will continue to enhance the livelihoods of pastoral communities. In doing so, PRIME will promote the viability and resiliency of pastoralist communities through market development and natural resource management. Activities fall under several main categories, including economic growth, greater participation of women, and climate change adaptation. As in the case of the Productive Safety Net Program Graduation project, PRIME integrates nutrition objectives into its overall approach by coordinating with the Empowering New Generations in Improved Nutrition and Economic Opportunities (ENGINE) project.